Pristine, wild with huge herds of game roaming unhindered by fences across the Kalahari’s plains and the waterways of the Oakavango Delta. This is what Botswana is known for. It is considered one of Africa’s top safari destinations. The diversity of habitat is astounding and private concessions with small lodges that limit visitor access assure that you don’t come across other visitors too often. You get what you pay for! Safaris in Botswana are top notch and so are the prices. But even so, there is a range of pricing depending on what you are looking for. The public parks of Chobe National Park and Moremi Game Reserve have excellent wildlife viewing but you will share the area with other vehicles. Surrounding them are private areas that offer greater flexibility in regards to night drives and off-road driving to view game away from the tracks. Those private areas are very exclusive and you will only encounter other guests on game drives that are staying at the lodge with. You are in true wilderness! 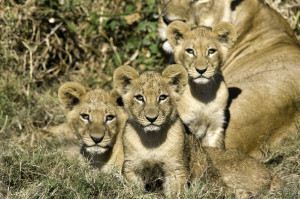 Here are sample itineraries that include a safari in Botswana or our Botswana – South Africa Itinerary. THE OKAVANGO DELTA is one of the world’s largest inland water systems. Its headwaters start in Angola’s western highlands, which then flows through Namibia (called the Kavango there) and finally enters Botswana, where it is then called the Okavango. Seen from space as an emerald swirl surrounded by a parched landscape, the Okavango Delta is an incredible source of life in a country that is 80% arid. Described as “the jewel” of the Kalahari, the Okavango Delta is a tranquil and isolated oasis set in Botswana’s harsh and arid desert – widely considered as being one of Africa’s best safari destinations with its special diversity of fauna and flora. The Okavango Delta is one of the largest and most important inland wetlands of the world, covering 16,000 km2, with 2500 species of plants, 65 fish species, 20 large herbivores and over 450 species of birds. Millions of years ago the Okavango river used to flow into a large inland lake called Lake Makgadikgadi (now Makgadikgadi Pans). Tectonic activity and faulting interrupted the flow of the river causing it to backup and form what is now the Okavango Delta. This has created a unique system of water ways that now supports a vast array of animal and plant life that would have otherwise been a dry Kalahari savanna. The delta’s floods are fed from the Angolan rains, which start in October. The floods cross the border between Botswana and Namibia in December and will only reach Maun sometime in July. The Okavango River which rises in the highlands of Angola never reaches the sea and flows southeast into the Kalahari. Here it spreads out into a delta formation covering over 15,000km² with a lush water-wilderness of papyrus swamps, shallow reed-beds and floodplains, dotted with islands and laced with a network of channels and lagoons. This slow meandering pace of the flood is due to the lack of drop in elevation, which drops a little more than 60 metres over a distance of 450 kilometres. During the peak of the flooding the delta’s area can expand to over 16,000 square kilometres, shrinking to less than 9,000 km² in the low period. As the water travels through the delta, the wildlife starts to move back into the region. As this region is referred to as ‘Delta’, the river source does not discharge into a standing body of water like a lake, or the sea. The Okavango is a large alluvial fan, a broad low gradient conical surface, over which the river discharges. The Okavango Delta consists of two regions, namely the upper linear panhandle sections and the lower delta shaped alluvial fan. As is common in meandering rivers, the channel in the Panhandle is undergoing constant changes. This manifests by the formation of oxbow lakes as well as by the splitting of the channel at several points along its length. The channels are characterized by permanent swamps in which the vegetation is dominated by Cyprus Papyrus. The Okavango River then divides into a number of distributary channels in the alluvial fan shape. The permanent swamps are characterized by a number of large lakes of which most are ancient oxbow lakes. The lower regions of the delta are seasonally flooded and these are known as the ‘seasonal swamps’. There are three main channel systems which are separated by ‘tongues’ of permanently dry land. These sandveld tongues separate the Thaoge and Jao-Boro systems, whilst Chief’s Island separates the Jao from the Boro system. The rainfall in the catchment area during the summer months (December to April) is discharged into the Okavango River and peaks at Mohembo, which is at the top of the Panhandle, normally in April. This is when the water level in the Pandhandle rises considerably and then filters through the rest of the delta. The seasonal fluctuations in the water level decreases down the Panhandle and in the permanent swamps of the upper reaches of the delta. The timing of the maximum flooding of the Delta is ecologically important. It occurs during the dry winter months, when the surface water in the surrounding terrestrial environments is in short supply. In the past, extensive game migration routes existed due to this, however these migrations no longer occur, but local migration of game into the immediate vicinity of the Delta lead to high concentrations of game during the winter months. The Okavango Delta has been under the political control of the Batawana (a Tswana sub-tribe) for several hundred years. Most Batawana, however, have traditionally lived on the edges of the Delta. Small numbers of people from other ethnic groups such as Ovaherero and Ovambanderu also now live in parts of the Okavango Delta. The Delta is home to over 140,000 people, 50% of whom live in villages with less than 500 inhabitants, living off the goods and services the delta provides. Their livelihoods are closely interwoven with the diversity of natural resources. As the Okavango Delta always has a certain amount of water, water based activities are on offer at many of the safari camps situated in the Delta. A mokoro safari is a definite ‘must do’ for all guests visiting the Okavango Delta – a dug out canoe which is ‘poled’ along by your guide is a favorite method of exploring the waterways. Motor boats operate on the main waterways and lagoons. Traditional 4×4 Game viewing vehicles are used on the main islands, with night drives available in the private concession areas but are not allowed within the public areas of the Park. Walking safaris are very popular in the Delta – the feeling of being on foot in Africa’s wilderness, exploring the flora and fauna is a remarkable experience – perhaps the most exciting way of viewing game – stalking and tracking wildlife with an expert guide. The Okavango Delta provides a true big five safari experience, with vast herds of elephant, buffalo and hippo making this fertile region their home, as well as numerous antelope, giraffe and zebra, followed by lion, leopard, cheetah and the stealthy crocodile. The delta environment has large numbers of animal populations that are otherwise rare, such as red lechwe, sitatunga, wild dogs and wattled crane. This area is a popular destination for bird watchers with over 450 species recorded, including many Okavango specials and lots of migrants during the summer months. Almost the entire inner Delta is only accessible by light charter aircraft. Most of the lodges have their own airstrips or share the airstrips with other lodges in the area. As the Okavango Delta is an exclusive destination, it remains relatively wild, unpopulated and untouched. The first glimpse of the Chobe River – deep and dazzling in the sandy terrain – is always breathtaking. It appears as a swathe of brilliant, peacock blue ribbon, winding its way through the tiny town of Kasane, and ensuing wilderness – the Chobe National Park. Undoubtedly one of Africa’s most beautiful rivers, the Chobe supports a high diversity and concentration of wildlife. Established in 1968, the park covers approximately 11 7 00 sq kms, encompassing floodplains, swamps and woodland. The Chobe River forms its northern boundary. There are four distinct geographical areas in the park: the Chobe Riverfront, the Ngwezumba pans, Savuté and Linyanti. The most accessible and frequently visited of Botswana’s big game country, the Chobe Riverfront is most famous for its large herds of elephants and cape Buffalo, which during the dry winter months converge upon the river to drink. During this season, on an afternoon game drive, you may see hundreds of elephants at one time. You may be surrounded by elephants, as the main Serondella road becomes impassable and scores of family herds cross the main road to make their way to the river to drink, bathe and play. Driving the loops that hug the river’s edge, you may see up to 15 different species of animals on any one game drive, including waterbuck, lechwe, puku (this is the only part of Botswana where they can be seen), giraffe, kudu, roan and sable, impala, warthog, bushbuck, monkeys and baboons, along with the accompanying predators lion, leopard, hyena and jackal. Take a river cruise – and you’ll experience the park, and the animals, from another vantage point. Here you’ll get up close and personal with hippo, crocodile and a mind-boggling array of water birds. Much game passes through Savuti (loacted in the south-west of Chobe National Park) on annual migrations between Botswana’s dry interior and the rivers of the north and west. Zebra visit in large herds, accompanied by impala, wildebeest giraffe, tsessebe, buffalo and elephant. Most animals head for open plains to the south and east of the Chobe National Park during the green months (December to March). Gradually, from April to November, as the land dries out and the heat builds, they migrate back to rivers in the north and west. Some animals maintain permanent territories in Savuti. 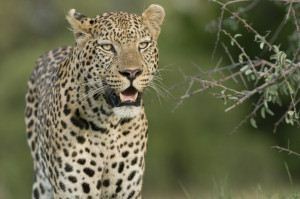 Leopards are seen around the granite kopjes and packs of spotted hyena and prides of lion are notoriously large. Old bull elephants are always found in the Savuti area. Activity often happens around Savuti’s three waterholes, and in the last few years the lion here have made a specialty of killing sub-adult elephants. The Savuti area offers great game viewing at most times of the year. The annual zebra migration is followed by large concentrations of lion. Good sightings of cheetah and leopard are possible and the endangered wild dog also occurs here. Savuti is famous for its large concentrations of elephants that congregate around the waterholes. This makes game-viewing exceptional and hides at waterholes is also a special feature of this area. Birdlife is also amazing with large secretary birds and kori bustards often seen around the Savuti Marsh. Summer migrants and water birds include Abdim’s Storks, Carmine bee eaters, fish eagles, quelea finches. A spectacular sight are the redbilled queleas that gather in their thousands. The rainy season falls between November and April, which is during the summer months. The wildlife moves towards grassy areas during this time. During November/December, thousands of Zebra migrate from the Linyanti in the north to the south of Savuti in order to graze in the grasslands of the Mobabe Depression. During the summer months, the humidity and heat is very high. The dry season is during the winter months, May to October. The water pans that filled up during the rainy season are now dry and the animals venture towards the man-made waterholes. During the months of September and October, the temperatures can be extremely hot. This makes for excellent game viewing as the predators are concentrated around the watering holes. The Moremi Game Reserve is situated in the eastern part of the Okavango Delta, bordering the Chobe National Park on the south-western part of the Park. The Moremi Game Reserve covers almost one third of the Delta. The Okavango Delta is the largest inland river delta in the world and consists of pans, floodplains, lily covered lagoons, grasslands, forests of acacia trees, savannahs and dense Mopane Woodlands. With such a wide variety of vegetation comes an diverse spectrum of wild life. Huge herds of impala and tsessebe are found in the area, while in the dry season large herds of buffalo, wildebeest, elephant and zebra flock into the reserve from the Kalahari in search of food and water. The rare sitatunga and lechwe antelope live in the papyrus banks of the waterways. Lions, cheetahs and packs of wild dogs hunt in the open grassland. The reserve is home to over 400 species of birds, including the African Fish Eagle, the Crested Crane and the Sacred Ibis. This vast variety of mammal, bird, insect, plant, fish and reptile species have successfully adapted to the swamp conditions. Moremi Game Reserve is a wilderness paradise with great game viewing throughout the year. This wildlife reserve was declared by the BaTawana people in 1963, the first wildlife sanctuary to be created by an African tribe in their own area, and as such is unique. During the early 1960’s the BaTawana tribe was governed by Mrs. Moremi, the widow of Chief Moremi III. She was concerned about the increase in game hunting and established the game reserve on her own land. The area was initially run by the Fauna Conservation Society of Ngamiland. The reserve has since been extended to include Chief’s Island in 1976 and during 1979 the park was taken over The Department of Wildlife and National Parks. On the northeast tip of Moremi, Khwai River is an area where tall evergreen trees line a wide floodplain. It boasts an excellent density and diversity of predator and prey species. Leopard sightings are consistently good in the Khwai area. Saddle-billed storks, wattled cranes and many species of kingfishers and bee-eaters are common. In the heart of Moremi, at the tip of the Mopane Tongue, lies Xakanaxa Lagoon. Mopane forests and a patchwork of deep waterways and shallow flooded areas, create a beautiful area packed with game. Leopard and cheetah are regularly seen and the density of antelope is amazing. The area’s birdlife is exceptional. Moremi is best visited in the dry season when game viewing is at its peak (July to October), this is when seasonal pans dry up and the wildlife concentrates on the permanent water. The winter months of May to August can be very cold at night, but pleasantly warm with clear blue skies, during the day. From October until the rains arrive in late November or early December, the weather can be extremely hot – day and night. Teeming with bird life and wildlife makes Moremi a prime wildlife area where elephant, hippo, buffalo, lion, and most other game (including eland, kudu, roan antelope, and if you’re lucky even leopard) can be seen in abundance. Bird life (both in the delta and dryland sections) is excellent especially along the Khwai River. During the dry season a congregation of all species, (bird and wildlife), along permanent rivers and water holes makes Moremi Game Reserve one of the most unforgettable wildlife experiences in Africa. Imagine an area the size of Portugal, largely uninhabited by humans. Its stark, flat, featureless terrain stretches to eternity, meeting and fusing with a milky-blue horizon. This is the Makgadikgadi – an area of 12 000 sq kms, part of the Kalahari Basin, yet unique to it – one of the largest salt pans in the world. The Zebra and Wildebeest herds migrate in their thousands to the river at the end of winter to access the water. The Makgadikgadi is a harsh, dry environment, suited to Oryx and Kudu, but the river provides a life-giving source of water for the Zebra and Wildebeest utilising the eastern grass plains. 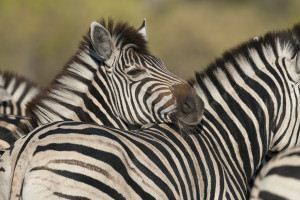 After the start of the rainy season, this desert area teems with wildlife as herds of Zebra and Wildebeest graze to their hearts’ content on the wide-open green grassland plains of the Makgadikgadi. During the wet season there is an influx of migratory bird species, while resident desert species welcome their visitors by showing off their breeding plumage.